The Andersen 3000 Series Self-Storing Storm Door is one of our most popular anytime storm door offering you a wide variety of features and options. This full light style storm door has glass from top to bottom to maximize your views, along with our most convenient features, low maintenance and durability. Backed by a limited lifetime warranty. The Andersen 2500 Series Self-Storing Storm Door offers quality at an uncommon value. This full light style storm door has glass from top to bottom to maximize your views, along with convenient features, low maintenance and durability. Backed by a limited lifetime warranty. The Andersen 3000 Series Fullview Storm Door is one of our most popular seasonal ventilation storm door offering you a wide variety of features and options. This full light style storm door has glass from top to bottom to maximize your views, along with our most convenient features, low maintenance and durability. Backed by a limited lifetime warranty. The DreamLine Visions shower or tub door offers breathtaking style for your shower area. Visions features a unique design with dual sliding doors flanked by stationary glass panels to create an ample center point of entry. The Visions glides smoothly on sleek top and bottom rails, while the exclusive fast-release wheels make cleaning the glass and track a cinch. 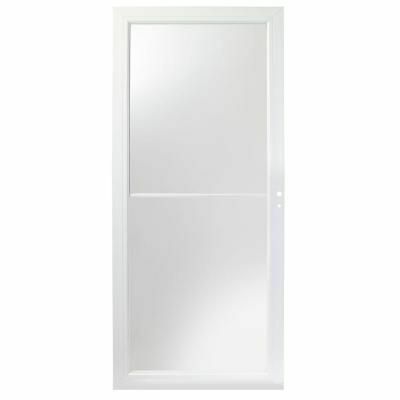 Transform your bathroom with the unique style of the Visions door for a beautiful balance of functionality and elegance. The included SlimLine Shower base features glossy acrylic finish that is scratch, slip, and stain resistant for safe showering. Base is reinforced with fiberglass for durability and requires direct-to-stud installation. Drain opening fits any standard 2 inch compression fitted drain (not included). The Visions shower door and SlimLine shower base kit provides the ultimate solution to your shower project. Create your own custom-look with a new steel cut-out Craftsman Masonite Entry Door. Engineered to last a lifetime, these high-performance smooth surface doors feature high-definition profiles for added architectural interest. Designed with an energy saving polyurethane door core, the maintenance-free construction provides maximum protection and durability. Choose from our easy-to-install in-stock or speical order glass styles. . Handleset sold separately. 32-inch W 3000 Series Self-Storing Storm Door The Andersen 3000 Series Self-Storing Storm Door is one of our most popular anytime storm door offering you a wide variety of features and options. This full light style storm door has glass from top to bottom to maximize your views, along with our most convenient features, low maintenance and durability. Backed by a limited lifetime warranty. 32-inch W 3000 Series Self-Storing Storm Door is rated 4.5 out of 5 by 55. Rated 5 out of 5 by Buffalo1948 from This is truly an exceptional product and the installation was... This is truly an exceptional product and the installation was excellent! Rated 5 out of 5 by Tina from My experience was even more than I expected and the... My experience was even more than I expected and the product I absolutely love it. Easy install and beautiful . Im so happy. Rated 1 out of 5 by Robertmathis from Andersen is garbage The door takes longer than 45 minutes to install. I’m pretty handy . After the install door functioned fine for a while. After 3 months my closer went bad on my door no biggie wright? Wrong. I called Andersen figured they would just send me a replacement. No not that easy. There customer service is garbage. So after they wouldn’t send me a closer as a replacement for the defective one. I bought one from the Home Depot for 17$ so for 17$ I’ll never buy another storm door are window form Andersen. They are absolute trash to deal with. And I will never buy another product of there’s again.